A. Mark Flake, a partner at Sutterfield & Webb, L.L.C., attended LSU as an undergraduate, receiving a degree in Petroleum Engineering in 1984. Upon graduation from LSU, Mr. Flake attended Loyola Law School in New Orleans where he obtained his J.D. in 1987. 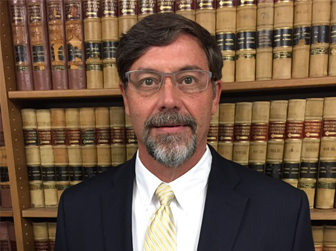 Mr. Flake has recently focused his practice on a general civil trial practice; including, Personal Injury, Admiralty/Maritime Law, Oilfield Personal Injury, Plant Accidents, Products Liability, Construction Law and Trucking Law, with an emphasis on defense. Mr. Flake also has experience in representing municipalities and governmental entities. Mr. Flake has been admitted to practice before all federal and state courts in the State of Louisiana as well as the United States Supreme Court. He also has an inactive license to practice before all Texas state courts. Bourgeois v. Boomtown, 10-553 (La. App. 5th Cir. 2/15/2011) 62 So. 3d. 166. Board of Administrators of the Tulane Education Fund v. La. Tax Commission, et al., 97-663, 97-664 (La. App. 4th Cir. 10/1/1997), 701 So. 2d 702. Citywide Testing and Inspections, Inc. v. Board of Ethics for Elected Officials, 96-1656, (La. App. 1st Cir. 5/9/1997), 693 So. 2d 1312. Parish of Jefferson v. City of Kenner, 96-73 (La. App. 5th Cir. 5/15/1996), 675 So. 2d 1177.